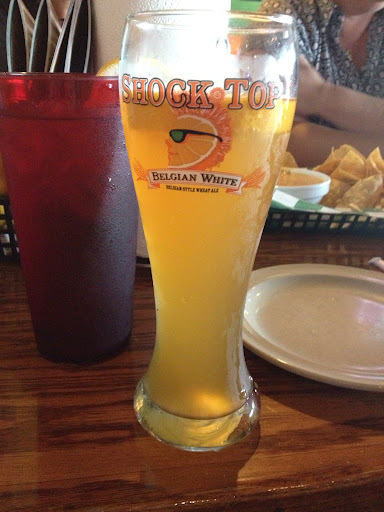 I am generally a pretty “happy person” but this ginormous Shock Top made me even happier on a Friday afternoon. It is always so hard to watch co-workers munch on chips, con queso, nachos, wings etc. although I would like to indulge, if you have ever run more then 6 miles you know that grease is not your GI tracks friend. So of course while everyone gorges themselves I sit and decide what I will eat when I get home, what I can throw together to give me energy for the run. 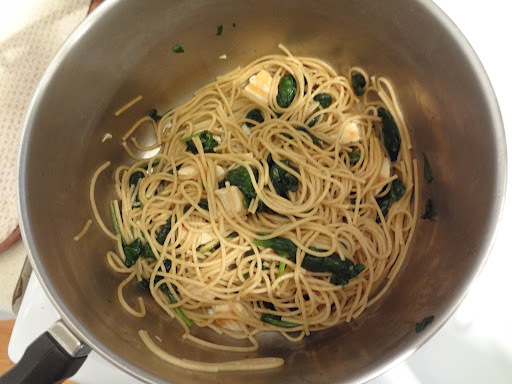 I threw together the rest of that spinach I had from breakfast, cut up a chicken breast that was starting to stare at me in the fridge, and whole wheat spaghetti (a runners best friend). I sprinkled Parmesan cheese and it was delicious. (I have a very serious addiction to Parmesan cheese, just ask my mom the “Parmesan” and black boots story). 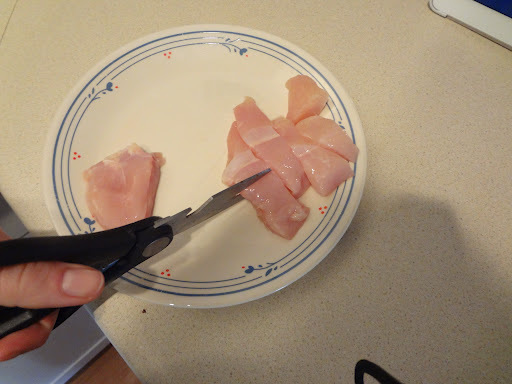 Also a trick I decided to try was to cut the chicken breast into bite size pieces with a scissor instead of cooking and then cutting…it turned out perfect and was so much easier then cutting after it has been cooked. It is not a “mama” trick, it is my original trick that I am sure no one has ever thought of before ! This is what I do on Friday nights, take pics of myself for this blog…aka I have the attention span of a 2 year old when I do grad work. 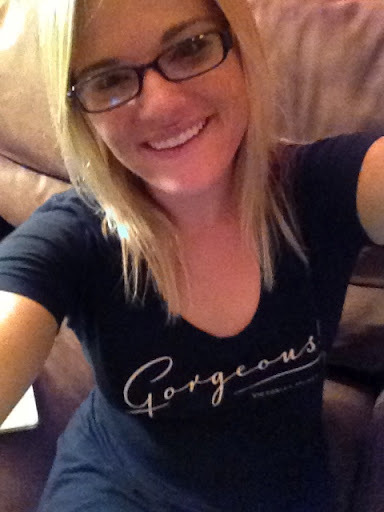 By the way, that Gorgeous tee I am sporting was ONLY given to me at Victoria’s secret when I spent more than $50…only me. That’s right. I was sleeping shortly after this, come on it was already 8:30 guys. This picture makes me seriously laugh out loud. This was taken before our eyelids were barely open. We always say it is good we do our long runs so early before our bodies know what the heck we are doing to them. 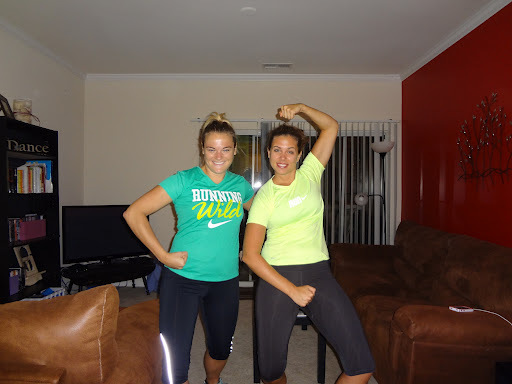 RR and I decided to do a “muscle” pose and this is how it turned out. Don’t you love my new Nike Dry Fit?? Runner roomie surprised me with that after my race last week! She is the best. It was the perfect shirt today because we truly ran in the wild. We did a nice long country run and saw cows, deer, dead snakes (RR did NOT like this), and best of all we discovered where the English Muffin Factory is! This is no joke…I could see RR in front of me (she is always in front of me:) starting to sniff and I looked to the left and there was a Thomas’s English Muffin factory! This would’ve been fantastic if we were finishing our run..but I think we still had about 10 miles at this point…whomp whomp. I have told many people when they ask “what do you think about for 17 miles?” my answer is food, food, food, and more food. 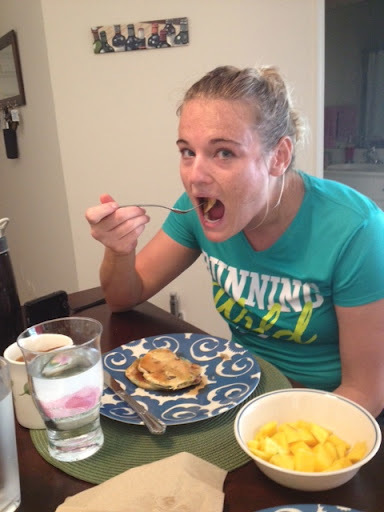 RR and I tried Chobani pancakes the other weekend after a long run so we decided to give them a whirl again. 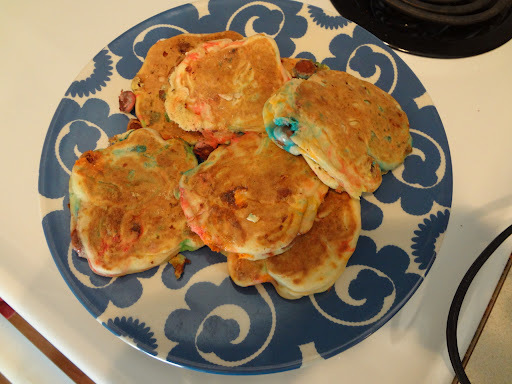 We put a little spin on it this time and made them “Tie-Dye” pancakes. 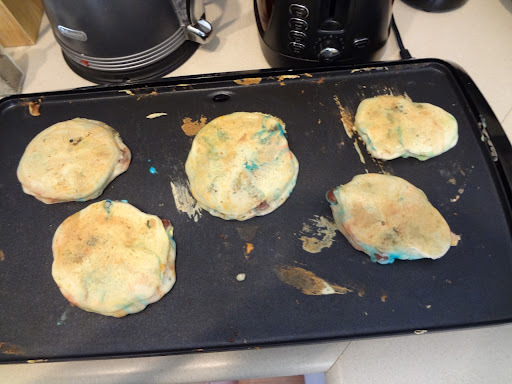 They turned out delicious. 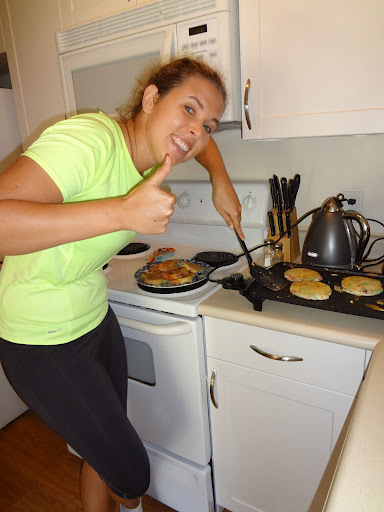 Here is the link to Chobani Pancakes. 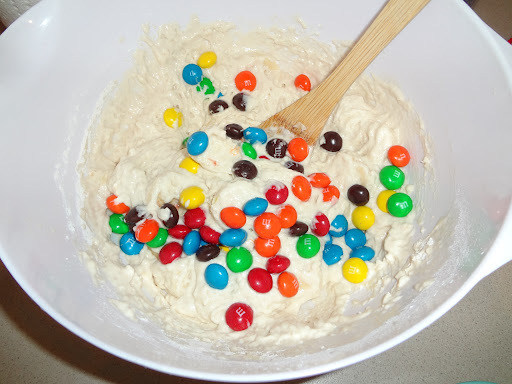 Then all we did was add Peanut Butter M&Ms (because Rite Aid didn’t carry chocolate chips…but I was glad, the substitution with these guys was AMAZING! 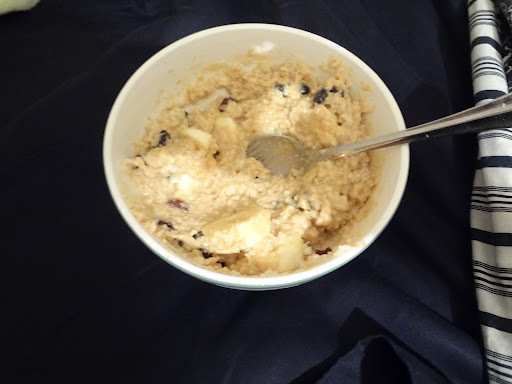 )… then we added two chopped up bananas. Bananas are a runners second best friend. I chopped up some mango as well because I read in Runners World 108 Best Foods for Runners that Mango’s are also a great thing for runners to eat as well as maple syrup…don’t worry we fulfilled that need! We did have leftovers…but not many! RR wants to share with our visitors that we are having tonight…and I was being rude and said ” NO WAY!” I get very territorial over our Post-Run Meal. Good thing RR is nice. I am sure you couldn’t wait to read about blisters. This post is dedicated to Sessy who thinks my feet are so repulsive she literally yelled “ew” for an entire hour straight last weekend. So I decided to go get a nice pedicure today to reward myself for a long run, and a delicious pancake concoction. Well I want everyone to know that the nice little man doing my feet (he is now my new BFF) told me ” I have seen blisters many times, but NEVER have I seen them this bad.” So…I officially have the worlds BEST blisters. Pretty. Don’t worry I will spare you a pic of the blisters. This is a very flattering picture of my thigh! The end result! Didn’t he do a great job? I sure hope he is able to eat dinner tonight. I swear no color on these sausage toes makes them look any slimmer. God gave me chubby fingers and toes, gotta accept it! At least I have the World’s Best Blisters:) Okay enough for now, people are staring at me in Starbucks for taking pictures of my feet. What are you doing on this beautiful fall day? Did you run too??? Have any funny pedicure/manicure stories to share?